Does it really looks like me? 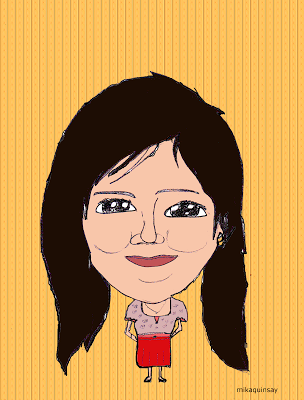 This cartoon version of me was courtesy of my daughter Mika. She loves cartooning and she had made one for her grandma, me and her kuya. Well, I haven't seen yet her cartoon version of her Dad. I'm happy that when Mika hits the teen years, she's been showing some hidden talents which I've never seen or discovered yet when she was still in the primary. She draws well and she's very artistic. A number of her friends are asking her to make a cartoon version of them and that only means that they appreciate her works. Wow. Many talents si Miks ah? Excellent in Music and Also very creative. That's the work of the left brain. Mas strong ang left brain kaya musically inclined and very artistic sya like me! Haha. God is really good. Gandan ng lahi na binigay nya sa inyo sis! She got that artistic part from you. Very creative ka din sa home eh.